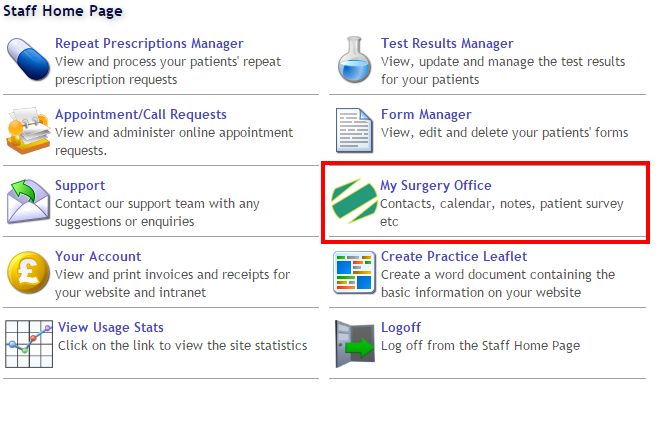 Your My Surgery Website is much more than a website - there is a lot of additional functionality included in the standard package. These features are organised into 3 different sections with different logins to ensure that the right staff only get access to the right area of the site. EDITOR: Is where you EDIT the website. Please note that when editing your website you should save what you are working on every 5-10 minutes to prevent loss of work. If the editor is idle (ie. you don't click the Save button or change page) for more than 10 minutes you will be automatically logged out and you may lose work. This is a security feature and can not be changed. STAFF HOME: This is a secure area where data from prescriptions, appointments and all online forms is stored. You can only gain access to this area from known IP addresses. If you are logging on from home you may see an error message stating that your ip address has not been recognised. If that happens please send an email to support@mysurgerywebsite.co.uk with the ip address that appears in the error message. Once it is added to the system you will have immediate access. MY SURGERY OFFICE: The surveys, polls, FFT, holiday planner and much more. You can read about this section in detail here. The EDIT and STAFF HOME login links are located at the very bottom of the site. If you can't see them then they are most likely obscured by the Cookie notification. Simply press continue to hide this notice and you will see the links you need to logon. Log on to the editor on the homepage and click the MSO link highlighted in the screenshot below.